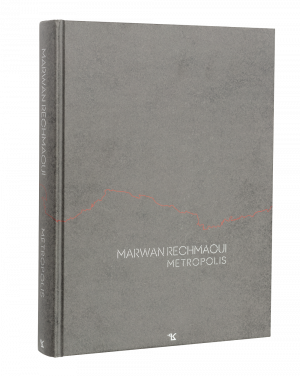 "Metropolis" is the monograph of artist Marwan Rechmaoui, covering twenty years of works. One of the most important post-­war contemporary artists from Lebanon and the region, Rechmaoui derives inspiration from the geography and rich cultural history of Beirut, his work often reflects themes of urbanization and contemporary social and behavioral demographics. Catherine David is deputy director at the Musée national d’art moderne, Centre Georges Pompidou, Paris. Previously, she was curator at Galerie Nationale du Jeu de Paume, Paris. From 1994 to 1997 David served as Artistic Director for documenta X in Kassel, Germany, and from 1998 on is Director of the long-term project Contemporary Arab Representations produced by Tàpies Foundation in Barcelona. In 2000, she organized The State of Things for Kunst Werke, Berlin. Between 2002 and 2004 David was Director of the Witte de With Rotterdam in the Netherlands. In 2008 she received the Bard Award for curatorial excellence in New York. Since 2007, she organized several events and exhibitions, amongst which a monograph exhibition of Bahman Jalali at Tàpies Fondation in Barcelona (2007) and the interdisciplinary event: Di/ Visions: Culture and Politics of the Middle East at Haus der Kulturen der Welt in Berlin (2007). In 2013 she presented MARWAN Early Works 1962-1972 at Beirut Exhibition Center. In 2014 UNEDITED HISTORY. IRAN 1960-2014 at Musée d’art moderne de la Ville de Paris, in 2015 WIFREDO LAM at Musée national d’art modern Centre Georges Pompidou and in 2016 DIA Al-AZZAWI: A RETROSPECTIVE (from 1963 until tomorrow), at MATHAF Doha. Kaelen Wilson-Goldie is a contributing editor for Bidoun who writes regularly for Artforum, Bookforum, and Frieze. She has traveled extensively in the Middle East and North Africa to report on the relationship between contemporary art and political upheaval, writing for newspapers, magazines, and journals including Afterall, Aperture, Parkett, and The New York Times, among others. In 2007, she was a fellow in the USC Annenberg Getty Arts Journalism Program. She won a grant from the Creative Capital Andy Warhol Foundation Arts Writers Program in 2014. She is working on a book about contemporary art in postwar, reconstruction-era Beirut. Waddah Charara is a Lebanese writer, journalist, translator, and professor of sociology. He was actively engaged in politics and syndicate activism until he cut short his activities just prior to the outbreak of the Lebanese wars. Choosing to devote his time to writing, Charara has written on diverse subjects spanning Lebanese political and social issues,Islamic political movements,literature,poetry,and cinema.